The Best Heirloom Tomato Salad Ever! It’s been a long, cold and generally miserable winter here in New Jersey. But the worst is behind us and after a brief Spring, we’re heading full throttle into Summer. And I can’t wait! All I can think about right now is planting my vegetable garden. I’m still a bit of a novice in the vegetable gardening department but I’m persistent if nothing else. Trouble is we live right next door to a woods. Very pretty and tranquil, but home to a variety of very hungry critters who enjoy popping over to my house for the all-you-can eat buffet that I diligently lay out for them every year. But this year I think I’ve finally figured out the fencing, so I’m hoping for a bumper crop. On the menu this year? Heirloom tomatoes and as many kinds as I can fit into the fairly small space I have crammed my garden into. Do you want to grow your own tomatoes but not sure how? Click here for some good information. 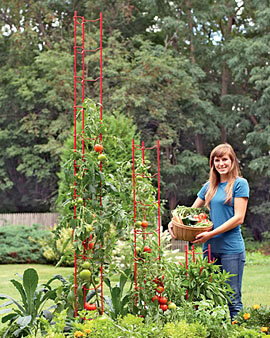 For staking tomato plants, I use these stacking tomato ladders. Completely hassle-free. That's not me. It's the advert, which is not a product placement, but a highly recommended suggestion. Last year I found the most incredible tomato salad dressing. It’s so good, that often my beloved and I would make a platter of tomatoes, douse them in the dressing and with a hunk of really good artisanal bread, we called this dinner. This recipe today comes from one of my favorite recipe sources, the Food52 Blog, from the writers of the The Essential New York Times Cookbook. 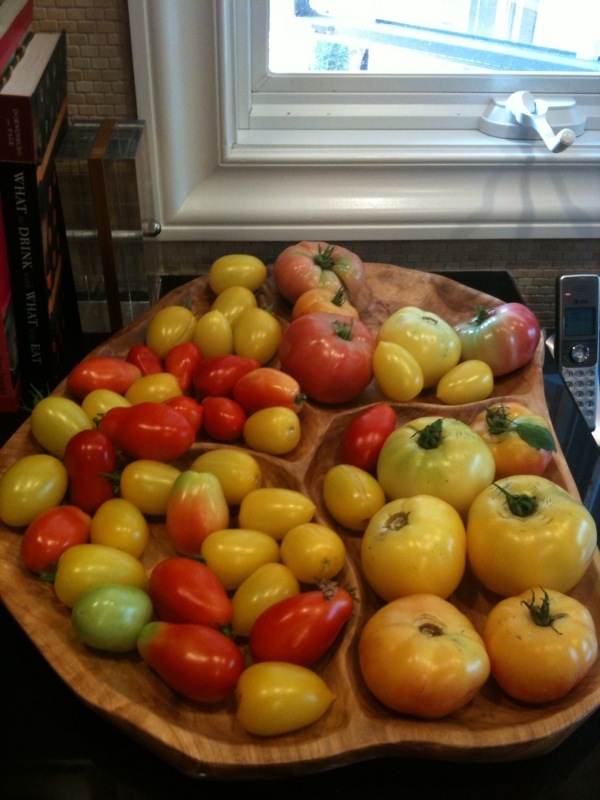 Arrange the tomatoes on a large plate or small platter. Put the garlic on a cutting board, pour the salt over the garlic and chop together until the garlic is cut into very small pieces and the salt begins to dissolve slightly. Put the capers in a small bowl and mash lightly with a fork. Add the garlic mixture and stir together. Add the vinegar and olive oil and mix well. Pour over the tomatoes. Sprinkle with the thyme and pepper. When I first considered creating this blog, I thought about the many stories I had read over the years about incredible women who faced insurmountable odds in their lives and yet had gone on to such great achievements and rich experiences. One such woman, Winifred Steger (1882-1981) hailed from my native Australia, and whose desperate circumstances and life as a single mother led her to the most unbelievable adventures in a time when these kinds of exploits by a woman were practically unthinkable . An account of Winifred’s incredible and fantastic life , written by Hilarie Lindsay, called “The Washerwomans Dream: The Extraordinary Life of Winifred Steger, 1882-1981“, is highly recommended reading if you can lay your hands on a copy. I literally couldn’t put this book down. After emigrating from England at ten years old, to the remainder of a deprived childhood spent in rural Australia eking out an impoverished existence from the land with her settler father, to her first abusive marriage to an alcoholic husband, then becoming a single mother to four young children by her mid-twenties, to finding work in remote outback Australia, going on to marry two camel drivers in succession and running a camel team, to traveling the world, being presented to royalty , to making the Hajj pilgrimage in Saudi Arabia, to becoming a published author, and living to nearly 100 years old, Winifred Steger was indeed a Can-Do Woman. Australia is a vast country, with mostly unpopulated desert making up a good portion of the land mass. Up until the early twentieth century, before roads and railways connected the cities with outback areas, the transportation of mail and other goods, was the responsibility of teams of camel drivers, many of whom hailed from Pakistan and Afghanistan, then part of the British Empire. As a resident of the Australian outback in her twenties, and a single mother of four children, Winifred had found work at an isolated outback hotel where she came into regular contact with the visiting camel drivers. She ended up marrying two of the camel drivers in fairly quick succession, and became the first, and perhaps the only, white woman to own and run a camel team in outback Australia. Have you read an incredible story of a pioneer woman? Or a story of an improbable and adventurous life of a seemingly ordinary extraordinary woman? Please share. Jacob A. Riis (b. 1849 – d.1914) was a social reformer, journalist and photographer who documented life in the slums of New York at the beginning of the twentieth century. His photos are incredible, and show with a gritty raw honesty, the abject filth and poverty that residents of the city’s tenements and streets dealt with everyday. By today’s standards of Western living, it’s unimaginable, how people survived in such crowded and dirty conditions. But survive they did. Raising families, working in sweatshops, battling to put food on the table, with either determination or resignation. Many of the area’s residents were immigrants who came through New York’s Ellis Island with dreams of a better life in America. For the immigrants who found themselves trapped in slum-life and this cycle of grinding poverty, I wonder if they ever questioned their decision to emigrate? On perusing Riis’s book, “How The Other Half Lives”, I was particularly moved by the photos of the women and children. What a terribly hard-knock life it must have been for these Can-Do Women and their families. Here is a selection of some of Riis’s photos which I think speak for themselves. If you’d like to know more about Jacob Riis and his work, click here for an excellent anthology including photo galleries by National Public Radio. And, if you are ever in New York City, I highly recommend a visit to the Tenement Museum on the Lower East Side, to get a feel for what life must have been like for the area’s residents at the time Riis took these photographs. What are your immediate thoughts when you look at these photos? Did any of your family come through New York’s Ellis Island? I’m the Can-Do Cook who’s constantly searching for the “best” recipe for everything that I like to cook, so I’m always trawling cooking websites and food blogs to try to find that perfect blend of ingredients. I’m also interested in healthier ways of eating and trying new and better takes on those favorite comfort foods. The perfect thin and crispy pizza crust is something that I’ve always longed for. And even better? A whole wheat version that doesn’t require a day to rise or a ton of physical exertion in the mixing and kneading. Well readers, I’ve found it, and it’s become a favorite weekend dinner in my house. It doesn’t even need a special pizza pan, and in fact, I often just use a cookie sheet smeared with a bit of olive oil and the pizza crust always comes out thin and crispy. You can even substitute the white flour and whole-wheat flour measurements for 3 1/2 cups unbleached white whole-wheat flour. For best results, I like the King Arthur Flour brand. Enjoy! 1. In a large bowl, dissolve sugar in warm water. Sprinkle yeast over the top, and let stand for about 10 minutes, until foamy. 2. Stir the olive oil and salt into the yeast mixture, then mix in the whole wheat flour and 1 cup of the all-purpose flour until dough starts to come together. Tip dough out onto a surface floured with the remaining all-purpose flour, and knead until all of the flour has been absorbed, and the ball of dough becomes smooth, about 10 minutes. Place dough in an oiled bowl, and turn to coat the surface. Cover loosely with a towel, and let stand in a warm place until doubled in size, about 1 hour. 3. When the dough is doubled, tip the dough out onto a lightly floured surface, and divide into 2 pieces for 2 thin crust, or leave whole to make one thick crust. Form into a tight ball. Let rise for about 45 minutes, until doubled. 4. Preheat the oven to 425 degrees F (220 degrees C). Roll a ball of dough with a rolling pin until it will not stretch any further. Then, drape it over both of your fists, and gently pull the edges outward, while rotating the crust. When the circle has reached the desired size, place on a well oiled pizza pan. Top pizza with your favorite toppings, such as sauce, cheese, meats, or vegetables. 5. Bake for 16 to 20 minutes (depending on thickness) in the preheated oven, until the crust is crisp and golden at the edges, and cheese is melted on the top. Give it a try and do let me know what you think. 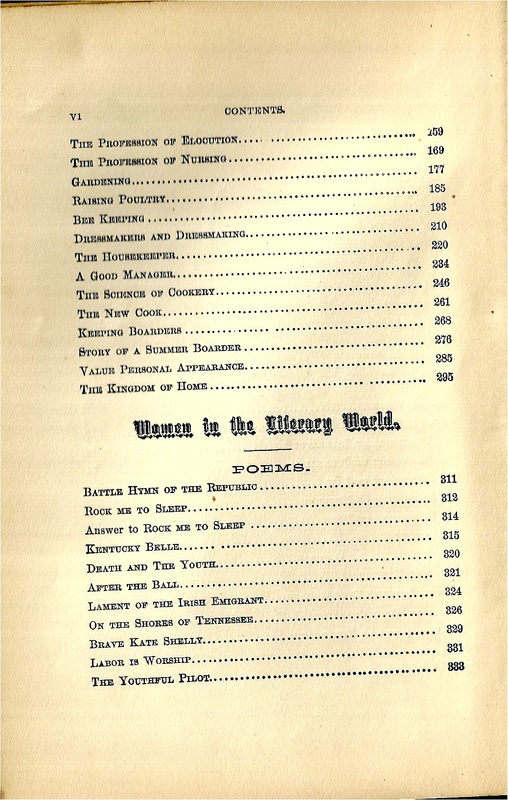 What Could A Woman Do in 1900? What Can A Woman Do? Indeed, this is the question asked by Mrs M.L. Rayne in penning what must be a very early example of an occupational handbook for women. The copy that I have in my library, although without a date, looks to have been written around 1900 or so. Now I don’t know about you, but I think these words could still be relevant today. Do we work to live or live to work? Mrs Rayne seems to be advocating that it’s of the utmost importance for women to do something they love – and get paid for it! Certainly words to live by, even by today’s career standards. In 1900, women represented around 19 percent of the total American workforce, compared to a figure of around 54 percent in 2009, and only 1 percent of the lawyers and 6 percent of the Nation’s physicians were women. (See attached article on American Labor in the 20th Century by Donald Fisk). Compare these figures to 2009, where employed women held around 40 percent of management, professional and related occupations. So what could a woman do in 1900? Aside from encouraging women to consider becoming teachers, journalists, lawyers and doctors which was clearly very progressive, Mrs Rayne highlights the possibility that women could also aspire to be wood engravers, or turn their hands to raising poultry or bee-keeping, amongst other choices. Are you surprised at the career choices that were available to women in 1900? Are you aware of any women in your family who held jobs during the 1900’s? What did they do? Are you a Can-Do Woman who loves to cook, or perhaps like many, you’re super busy, but you love the idea ? Well, I’m one Can-Do Woman who enjoys cooking all sorts of things. I’m not much of a baker, but just let me near a cookbook and pantry full of ingredients and I’ll have a delicious dinner, lunch or snack whipped up in no time. This being a magazine-style blog devoted to all things Can-Do Women, today’s post marks the launch of Can-Do Cooks as a regular feature of this blog, where I’ll spotlight my favorite recipes, and yours too if you would like to submit something. Easy, tasty, tried and tested recipes are what you’ll find in Can-Do Cooks. I’m feeling a bit under-the-weather today, so I thought I would share with you one of my favorite recipes for good old-fashioned Tomato Soup. I found this recipe in the New York Times a couple of months ago, and have since made this soup many times to great success. The magic ingredient here is the celery salt, so don’t try and substitute it – it’s worth a trip to the store if you don’t have it. Also I like to halve the recipe so that I don’t have to worry about left-overs. The soup keeps fine in the fridge for several days if you want to feed off of it.